Plans for the new Nauset Marsh Skiff. Hull has been sheathed with epoxy and fiberglass cloth, primed, and painted with a custom mixed Epifanes 2-part poly urethane paint. Strip planked side decks and flotation have been installed , custom console is modeled, Yeti cooler in place. Here's the finished boat , out in Wellfleet Harbor. More photos on the Old Wharf Facebook page. This is the first Swampscott dory, built in 1978 for Dr. and Mrs. Kite. I built another one, #7, for their son in 2013. Here is a detail shot of the last Swampscott I built- locust stem and breasthook , Cedar topsides planking, Marine ply garboards, copper riveted, Oak rub rails. Here's the boat, finished except for the final oiling of the bare wood. Garboard of the 650D in place. This light weight racing boat has no timber stem, so the stem jig keeps it all lined up. All painted up in Dutch orange, ready for oarlocks and sliding seat. Out for a test row. The Drake 19 is a cruising row boat designed by Clint Chase . Here the stems and keel have been fabricated and installed in the building jig, and the garboards have been fit and fastened. The boat has been planked, epoxy coated, and is being lifted off the building jig. Here's the Drake 19 fully finished, ready to go. Hello. My name is Walter Baron. I run the one-man boat shop you see on these web pages. 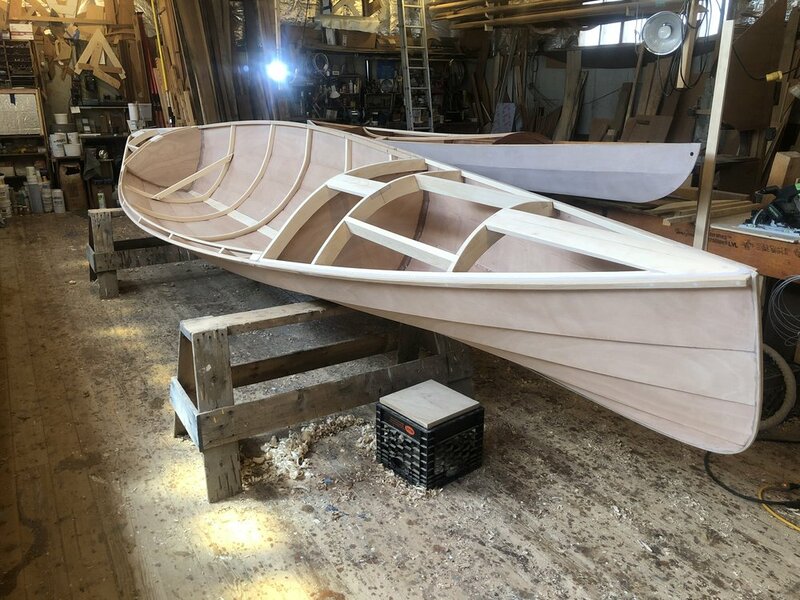 I build boats using wood as the main structural material, one at a time, in my shop in Wellfleet, Massachusetts, on Cape Cod. Using techniques ranging from Traditional Lapstrake to Plywood on Frame to modern Plywood/Epoxy/Fabric composite construction, I can build a boat suited to your particular needs. Most of my boats are based on traditional designs that have stood the test of time and sea. They are not the fastest or glossiest boats on the waterfront. They are comfortable and efficient, gaining character and patina with use, age, and care.In this age of rising fuel costs I would like to emphasize the advantages of wood boats. Most wood boats, especially those built with modern composite wood-epoxy-fiberglass construction, are much lighter than GRP (Glass-Reinforced Plastic) boats. This means that a boat of a given size can be powered with a smaller motor to produce the same performance. There are many designs, both traditional and modern, that fall into this category. Another advantage of wood boats is that the main structural material, wood, is a renewable resource. Trees still grow, unlike oil, which is a finite resource . The use of nonrenewable materials, such as epoxy adhesives and coatings add to the longevity of a boat and reduce maintenance. Added benefits include the beauty of wood, and the increased comfort due to wood's ability to absorb vibration.I will be researching advanced methods of wood construction as they become available. 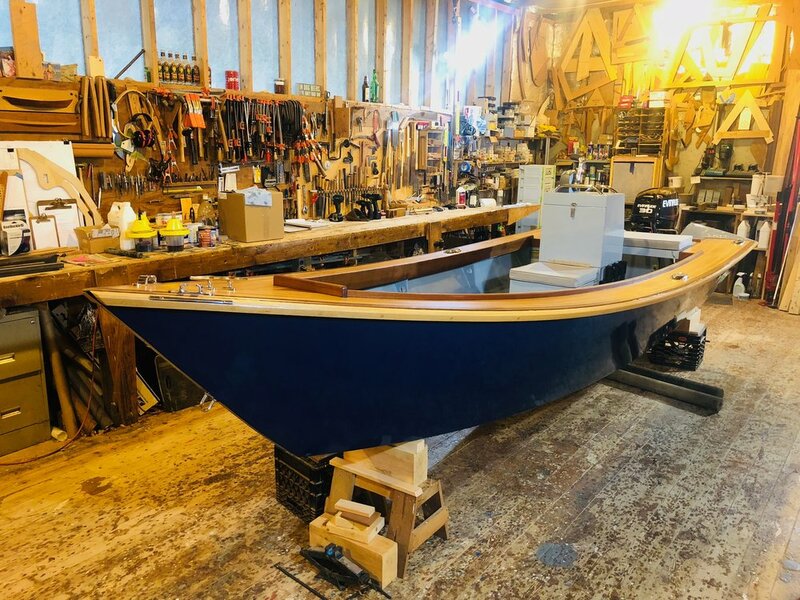 Recent boats built include a custom Nauset Marsh Skiff set up for fly fishing, a Swampscott Dory for the son of the owner of the first Swampscott that I built in 1978, Norrpa, a Savo 650D Finnish racing row boat designed by Ruud Van Veelen, a Cotuit Skiff, and a 19' Drake expedition rowing boat, designed by Clint Chase. 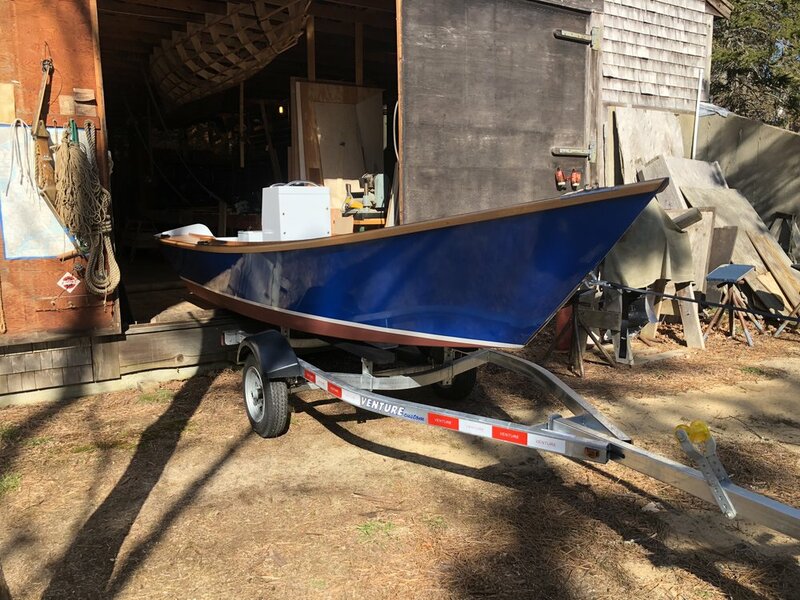 Since this original post I have built a Sinne 610 and a Savo 575, both designed by Ruud Van Veelan, an 18' work skiff designed by me 30 years ago or so,, and a 20' LYS, and am working on another Nauset Marsh Skiff , as of October 2017. After the 2017 NMS, I built another Nauset Marsh Skiff, #4. Next is a 16’ LYS research vessels for Woods Hole. Row, sail, or power, custom design or stock plan, contact me to discuss and build a boat suited to your particular needs. 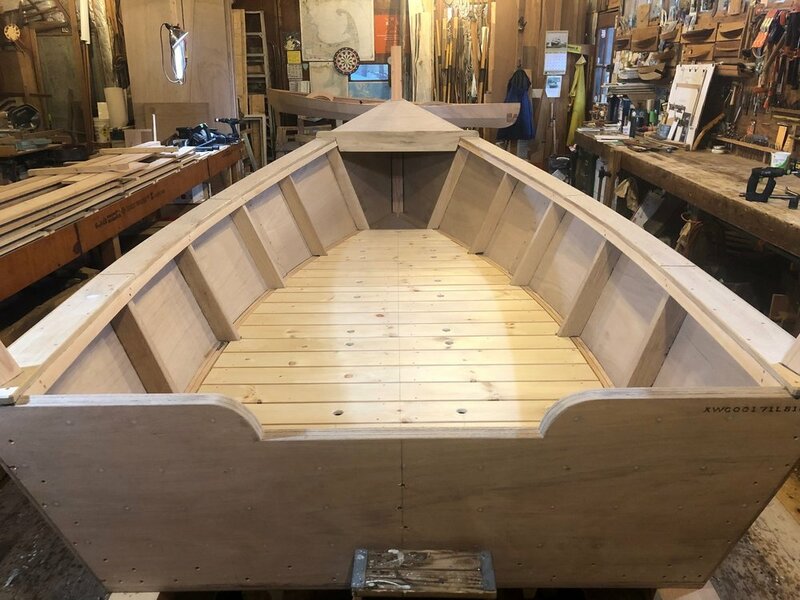 I can also build a kit boat for your if you don’t have the time or space to build something from Chesapeake Light Craft, Clint Chase, Hewes & Co, Puuvenepiste (Savo Boats),a skiff from PT Watercraft, or others. Lots of new info is posted on Old Wharf's Facebook page, so click on the little f's you may see on these pages. Well, the Savo 650D/R2AK is done, my part anyway, and is in Maine being finished up for the race. Final photos are up on the Facebook page. Here is a link to their web page, Rowing to Wild. A couple of photos are below. Next project is assembling a Northeaster Dory kit from Chesapeake Light Craft, for a lady from Provincetown. The Northeaster is a great rowing boat, tried one out at last year’s Wooden Boat Show. Also happening is the Spring Rendezvous, a rowing event put on by the Cape Cod Chapter, TSCA. I will be there, will be bringing a boat. Interior view from the stern- stern deck and bulkhead, inwales, extra frames. Bow View, foredeck, forward bulkhead, oak rub rails, oak stem band and keel strip. Ready for the trip to Maine. Next project is another Savo 650D, for the same people who own the first one. This boat will be a little different, the plan is to use it for long distance expedition style rowing. So it will be reinforced in several ways - exert frames, abrasion protection, decks bow and stern for storage and flotation, etc. They have already rowed the Maine Island Trail in the original Norrpa, here is a link to a story about the row. The title is “A Feast of Adventure”, by Leigh Dorsey. Also, she did an online presentation called “Rowing to Wild”, both very interesting. So they have some experience rowing distances, this should be an interesting boat. 1/29/19- Progress on the 16’ LYS-The boat is finished, and has been loaded onto the owner’s trailer and taken to her new home. The finished boat ready to go out the door. Options include long stem and stern posts, oak framing, side decks and rub rails, foredeck, locust coaming, pine floorboards. On the trailer, ready to go. 11/21/18- Check out the ash coffee table I have for sale on the Boats For Sale page ! Scroll down to the bottom. 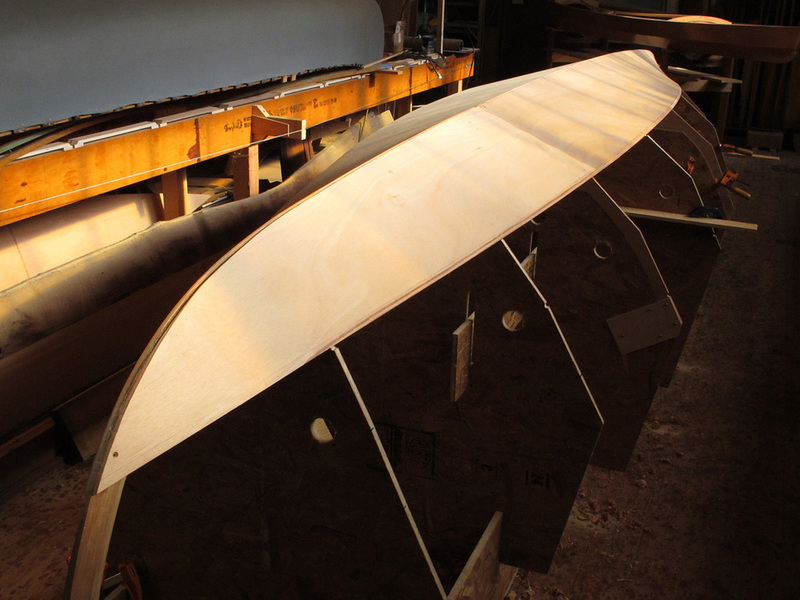 Check out the photo album of the recently completed Nauset Marsh Skiff. This is the 4th NMS that I have built, looks pretty good. Options on this boat include a casting deck with storage under, console with gas tank storage under the seat, floorboards/cable chase, and hinged aft seat. Power is a 30 HP Evinrude E-tec motor. Thanks to all who made the Rendezvous a great success ! We had beautiful weather, about 15 boats including a 6 oared gig, 2 traditional Banks dories, a CLC Northeaster dory rowed in from Orleans (and back later in the afternoon! ), and many more interesting boats. Here’s a link to a short video on YouTube, and here‘s a link to some photos on facebook. 10/11/18 - Just posted another video from the Rendezvous, aboard the Cornish Pilot Gig. It’s in several places including here on the On Rowing page, the Old Wharf facebook page, and youtube! Another new item in the Boatshop Store! I have added a 3 Fathom utility/dock line to the inventory. It is made of 3/8" Hempex synthetic 3-strand line, and is 18' long, with a 12" hand worked eye splice on one end, and a needle and palm whipping on the other. A nice addition to any small boat's gear. New Item added to the Boatshop Store! 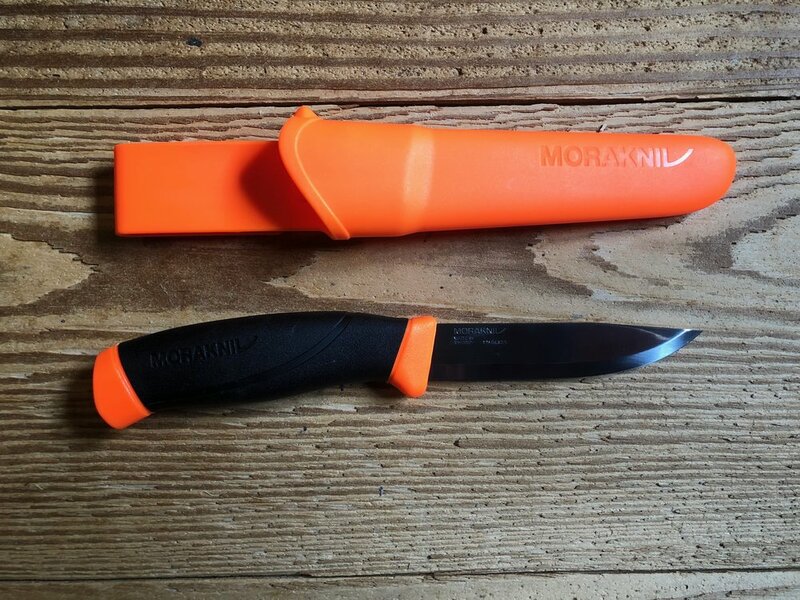 I have added the Mora Clipper Companion F, one of the best inexpensive knives for small boat use. Read more about it, and order one here. The next project is another Nauset Marsh Skiff. I will not be documenting the build, since I just did that on the Old Wharf Facebook page . This one will be very similar, same hull , side decks, console, but with a casting platform forward and one aft of the console. The aft one will fold up for access underneath. I will try to post some stuff from the archives, including Lumber yard Skiffs built from plans. Meanwhile, don't forget the Adirondack Guide Boat I have for sale . There will be a spring price reduction- check it out! 3/27/18- The boat is finished, and out the shop door. I brought it to a local marina for motor installation and rigging. The owner has seen the boat and is very pleased. Old Wharf Dory Co. is the Official US Builder of Puuvenepiste rowing boats, including the race-winning Savo 650 and 575. This year, 2017, is the 40th Anniversary of Old Wharf Dory Co. 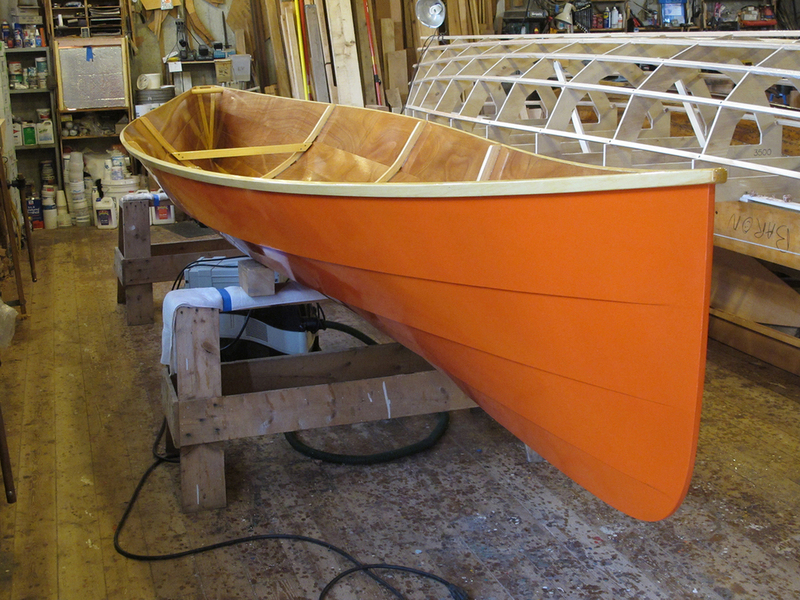 I started building boats in 1977, in my yard in South Wellfleet. I still have the second boat I ever built, an 8' Pram designed by John Gardner, from the pages of the old National Fisherman. I just refinished it, a photo is below. I have built over 165 boats, ranging from 6'6" to 35'. During that time I was also a carpenter, commercial fisherman, and timber framer. Be on the lookout for some special goodies to celebrate 40 years of boat building including T-shirts, hats, etc. Thanks to all my customers over the years, you all have excellent taste in boats! Here's the refinished pram- exterior paint Kirby Green-Gray, interior Swedish pine tar -linseed oil. is an 18' Work skiff I designed around 1984 or so. It is wide and low sided, so it sits nicely on the flats at low tide, and is easy to get in and out of. The low sides also make it easy to load and unload gear, bags of shellfish, etc. This boat will replace a 30 year old boat I built in 1986. Here's a link to the photo album. LOA - 18'0", Beam to inside planking, 7'1", Beam inside at chines, 6'0", Depth amidships, 1'8". 18' Work Skiff, on the rollers and ready to go out the door. Next project is building a Savo 575 race boat. Photos soon. The Savo 575 is finished, photo album here. Savo 575 on the beach at the 2016 Wellfleet Rowing Rendezvous. The Sinne 610 is finished and on the trailer. I will cover her up until the owner comes to pick her up. But first, as soon as we get some good weather- SEA TRIALS! 5/27/16 - Sea trials have been done, and are posted on the On Rowing page. Now, on to the next project- repair of a 17' Gardner/Herreshoff style rowing boat that got damaged in a recent storm. There is a lot of information on these pages, so don't be afraid to keep scrolling down. When you go into a slide show gallery, hovering over the photo will show the caption. This is a new web site and a new system, so things will probably be changing - stay tuned!